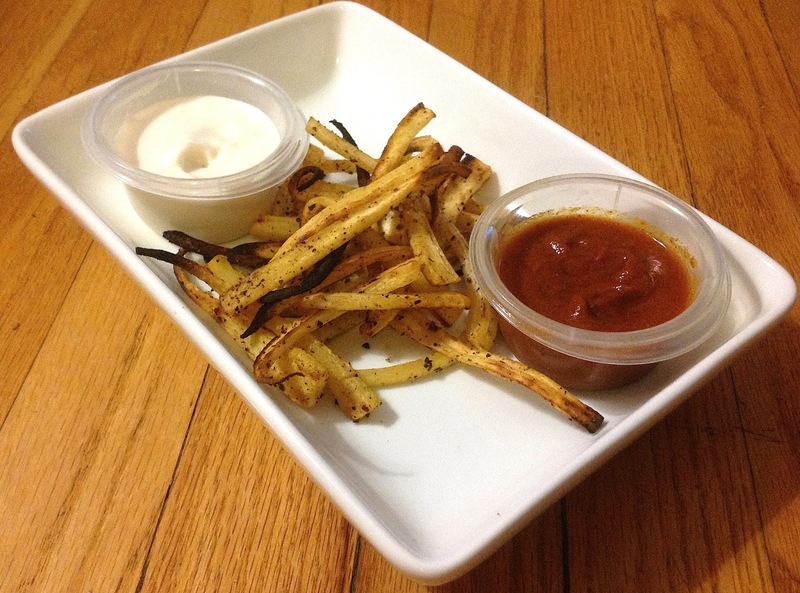 Say Good Bye To Your Typical Fries.....Baked Parsnip Fries! Love love love parsnips! Granted this root vegetable is a fall produce, but when you are craving some sort of starch and fry, I prefer to visit parsnips. Not only do I love the unique flavor of parsnips, but they are also lower in carbs and higher in fiber than a potato. The taste is a bit sweet and nutty and very distinctive. So good as a puree as well! In regards to carbohydrate content, they are somewhat in the middle of other root veggies. About 20 g less than sweet potatoes and yams, 10 g less carbs than potatoes, though rutabaga, carrots and and celery root are slightly less. Sometimes I wish I would shut up about sauces. Well, I can't. It really adds that extra element to really any dish. Clearly I love my sauces, but remember, use sparsely! Dressings and sauces do contain more calories than you think! Preheat oven to 425. Cut each peeled parsnip in half, then cut into strips. Once all parsnips are cut, blanch into an ice bath for about 10-20 minutes. I have come to conclude that this is a great method to make the fry crunchy without using corn starch. Once blanched, pat dry and toss with a bit of evoo and lightly season. Bake for about 10-12 minutes, then turn and bake for an addition 15-20 or until your desired crispy-ness. I like mine crispy, so I go for the lengthier method. Well, I am at it again....baking time. My last vegan carrot-orange loaf was such a success, I wanted to do another variation of it. Once again, I used the pulp from juicing. This time I made an apple-beet juice. The combo was delicious and thought, why not make another bread with the pulp? I made a few changes to this recipe, but they are very slight. If is always fun when you have a solid bread recipe to play around with it and use different flavors. 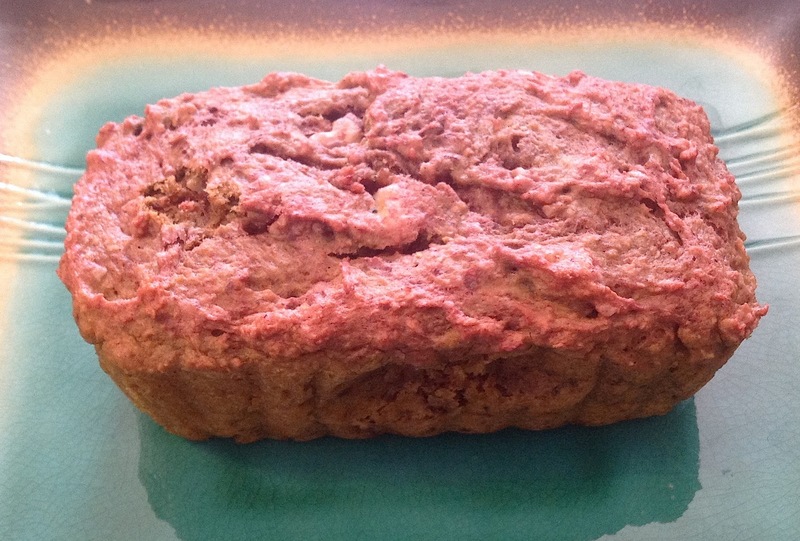 Apple-beet turned out quite delicious! 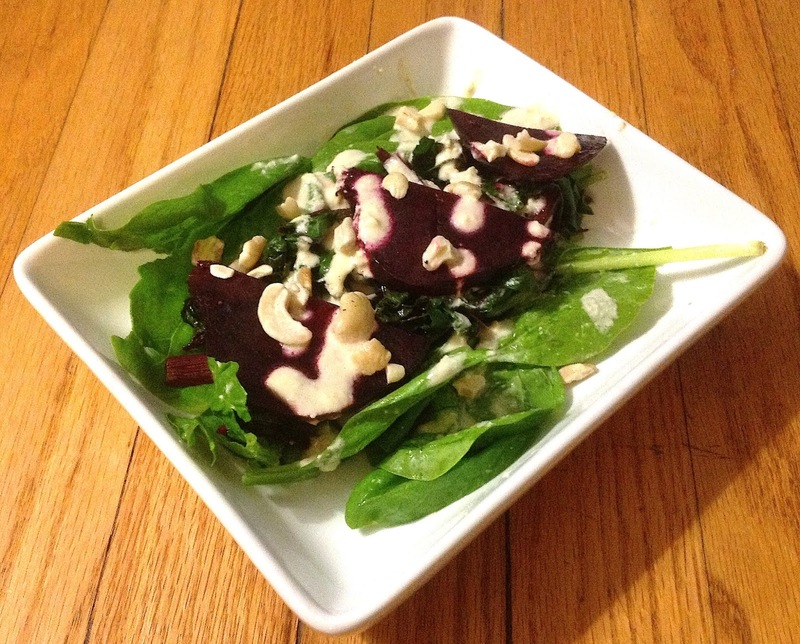 What I love about using beets is that they are so versatile. You can make them into something hearty, like a vegan burger or something light, like a beet salad. Or you can go the sweet route, like this bread. What is eye-catching is the beautiful color of the bread. When you cut a piece, it is a subtle red-pink color, almost that of a med-rare piece of meat. Hmmm....beet meatloaf in the future??? Preheat oven 350. Lightly oil your tin baking bread pan. 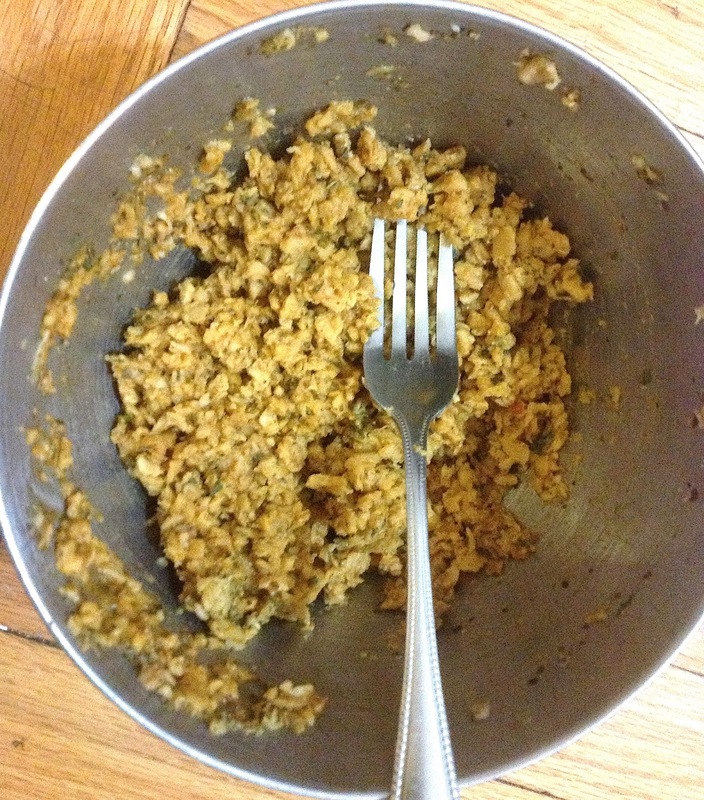 Mix all dry ingredients in one bowl and all wet ingredients in another (do not add carrots/orange yet). Combine the two and then add the grated carrots and orange rind. Fold in walnuts. Bake for about 40 minutes or until toothpick comes out clean. Let cool and remove from pan. Very few alterations to my prior bread loaf, but still another great idea! Kind of like a hot pot, but not so much because we are not cooking chunks of veggies or proteins in the pot. So technically this is my version of a vegan pho. So why is this so good and when does it taste the best? If you are fighting a nasty cold or feeling under the weather. Or, you wake up with a nasty hangover- I promise you will feel as good as new after a hot spicy bowl of this. Best part? So freakin' good for you! Please see note below by ingredients, as this dish is very versatile! So there are a few items in this recipe that I buy in Chinatown. 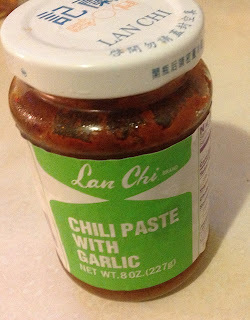 For one, is Lan Chi Chili Paste with Garlic. 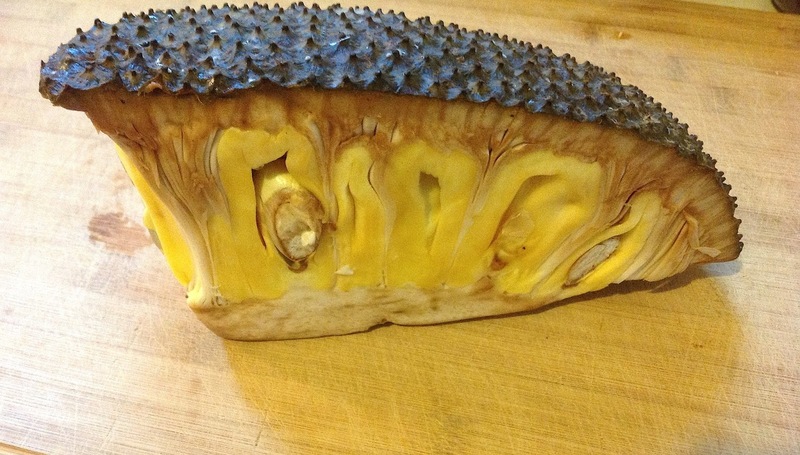 I am familiar with this product from managing an upscale Asian Restaurant in Chicago. We would use it in spicy bloody mary's or as bases to some recipes. For this particular recipe, I used it as part of the base of the broth to give it that spicy, garlicky kick. If you cannot find it, a simple chili paste would work. Other ingredients are woodear mushrooms and oyster mushrooms. If you cannot find them fresh, the best route to go is to buy assorted dried mushrooms in a package. You can find this at most grocery stores. Just rehydrate them in your broth and you are good to go! ***you can add in any and all ingredients you desire. The base is really what makes the hot pot. In a large pot, saute shallots, ginger and garlic for about 3 minutes. Scoop in chili paste and quickly add broth. Add in all remaining ingredients, bring to a boil and simmer. Cook noodles according to package. In meantime, add in tofu to broth to let warm. Once noodles are done, drain and place serving size amount into each bowl. Then, ladle in broth into each bowl. Take all the remaining ingredients and distribute to every bowl. 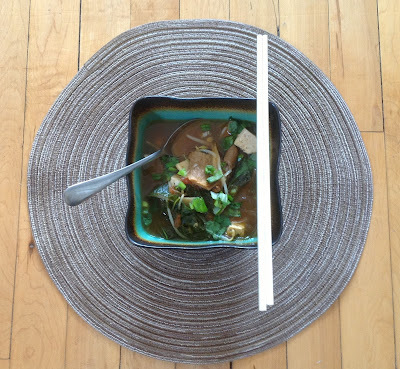 Or, if you are eating this in a communal setting, just add in all the soup ingredients to the broth and share! 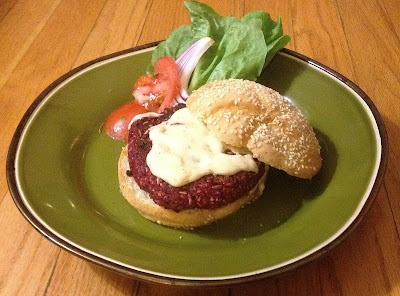 Beet of a Different Drum....Vegan Beet Burger! Who ever thought that beets would be a perfect main ingredient for a veggie burger? Well guess what? It is! It's actually now one of my favorite veggie burger recipe that I have made so far. So I love the taste of beets just on their own. But, after mixing in all the additional ingredients, you lose that beet-y taste and it really tastes like a burger. The trick is to squeeze and drain the beets after you cook them. Most of the flavor in the beets come from the juice. So, after that liquid is eliminated, you have a great substance for the burger. Plus, the red makes it look like the real thing! The tricky part in making vegan burgers is to create them to keep form. I hate sloppy burgers! That is why you should choose binding components, such as ground oats, garbanzo beans and black beans. Add panko crumbs if you are ever questioning the firmness. Also, placing patties in the freezer for about 20 min. helps to maintain firmness....great little trick! Preheat oven 400 and roast beets in foil for about an hour. In meantime, blend rolled oats in food processor until powder. Place in bowl and set aside. In saute pan, heat evoo on medium and saute onion and garlic for about 3-5 minutes. Once beets are done, peel and cut. Place beets, chickpeas and black beans in food processor and pulse about 10 times. You don't want it to be completely blended. Place pulsed/chopped beet mixture in mixing bowl and add in cooked onion and garlic. Mix in all the remaining ingredients, including the blended rolled oats. Adjust seasoning if need be. Form into patties and place in freezer for 20 minutes. To cook, take saute pan, heat evoo and cook each patty in pan for about 3 minutes on each side. Serve on favorite bun and add your favorite toppings! I really wanted to do another Japanese inspired recipe today using portobello mushrooms, but I couldn't find the primary ingredient I needed(insert tear). That totally threw off my game plan at the store, and had to think on my toes. I already had a bag full of beautiful portobellos and soba noodles at home, so I knew I wanted to go in a Japanese direction. So...why not a teriyaki "steak"? Portobellos are a great steak replacer because of their meaty texture. 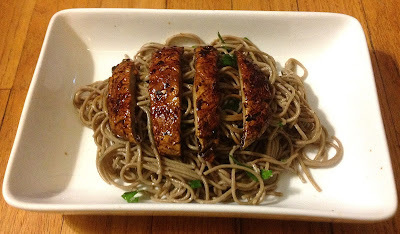 The mushroom steak is bursting with flavors, making the soba salad a perfect accompaniment due to its subtle flavors and lightness. To make marinade, combine all the ingredients aside from mushrooms in a blender and blend. Take your portobellos and soak in marinade for about 30min-1hr. 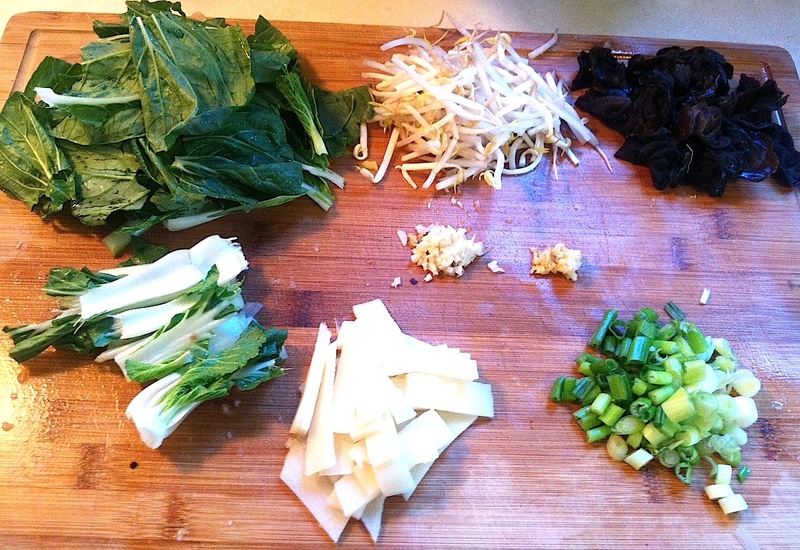 (Start making soba noodle salad. Directions below. Once marinated, heat grill and grill mushrooms for about 5-7 minutes, basting with more marinade. Mushrooms should have nice grill marks and slightly soft to the touch. Slice into nice slices when done. Boil water and cook soba noodles according to pasta. Drain and move to bowl. Mix with remaining ingredients and let cool to room temperature or place in refrigerator. 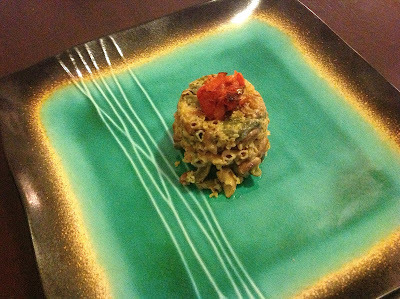 When plating, spoon a nice portion of noodles on plate and top with portobello steaks! Here is another recipe where nothing goes to waste. Most people don't know, but you can cook with the entire beet. That means the bulb, the beet leaves and the beet stalks. And by using all parts of the veggie, you get a variety of textures with just one plant. Although, I did throw in raw baby spinach to have a raw aspect to the salad, since everything else was cooked. So what makes this a "Japanese" style salad? The dressing of course! The ginger-citrus vinaigrette has raw almonds, fresh orange juice and fresh grapefruit juice, a healthy amount of ginger, rice wine vinegar and mirin. I paired this salad with a Teriyaki "Steak" with a simple soba noodle salad. You could have this as a warm salad, on top of cool baby spinach, but I had time to let the cooked beet and sauteed beet leaves and stalks to cool in the fridge. If you don't have raw cashews, just make the dressing, omitting that ingredient. The cashews were just meant to give it creaminess. Preheat oven 375. Wash bulbs, oil and wrap in foil. Cook for about 45 min- 1 hr. In meantime, wash beet leaves and stalks and dry. Heat sesame oil in saute pan. Saute the chopped stalks for about 5 min, then add in leaves. Saute until greens have wilted (about 2-3 min). Remove, transfer to plate and cool in fridge. For dressing, take 1 tbsp evoo and the remaining ingredients (except spinach and blend until smooth. Once beet is cooked, remove foil, peel and slice (use gloves because your hands will stain!). Cool to room temp and start forming the salad. Toss dressing with spinach, top with sauted greens and stems, and then beets. Pour dressing over and throw on some more raw cashews (optional). 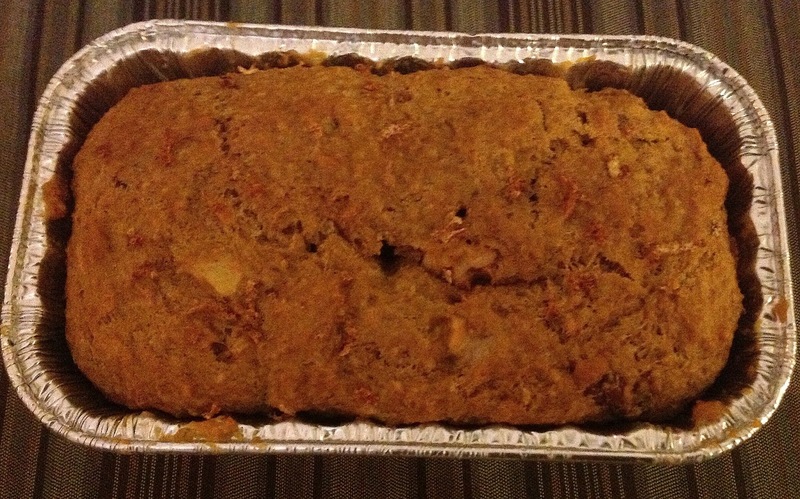 There is no waste in this Plantry!......Vegan Carrot-Orange Cake! This is probably the most creative and resourceful recipe I have done thus far. 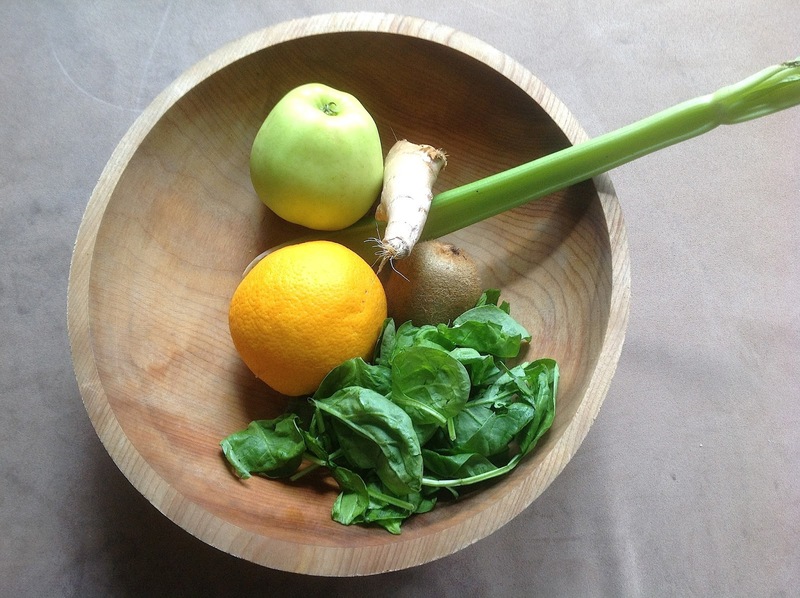 I recently got my beloved juicer back and have been juicing like a crazy women. Every time I juice, the left over shredded pulp from the fruits and veggies just stare back at me. Most people just toss them out. But, stop right there!!! You can do so many things with it! For instance, you can add them to a dip or a sauce, or even a part of a salad. Or, you can bake with it! There are so many restaurants and stores that use every part of an veggie or really anything. And, it's true! Think twice about the next time you are tossing something in the garbage. Most likely it has use. I will touch upon some other creative ideas in the future.....one step at a time here! I realize a lot of people don't have juicers. If you don't, no worries! Simply finely grate carrots and orange rind to make roughly 1.5 cups. Also note that this is not overly sweet. If you desire a sweeter taste, replace agave nectar with brown sugar. Preheat oven 350. Lightly oil your tin baking bread pan. Mix all dry ingredients in one bowl and all wet ingredients in another (do not add carrots/orange yet). Combine the two and then add the grated carrots and orange rind. Pour into baking pan and sprinkle lemon zest of top. Bake for about 40 minutes or until toothpick comes out clean. Let cool and remove from pan. I went to my local grocer and they had such an amazing deal on zucchini....I bought 7 beautiful zucchinis for only $1.50. I mean really? Who would turn that down? 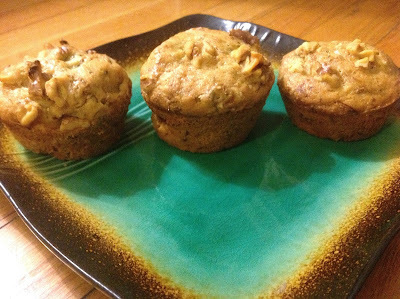 They sat in my fridge for a day, until I thought....Zucchini Muffins!!! 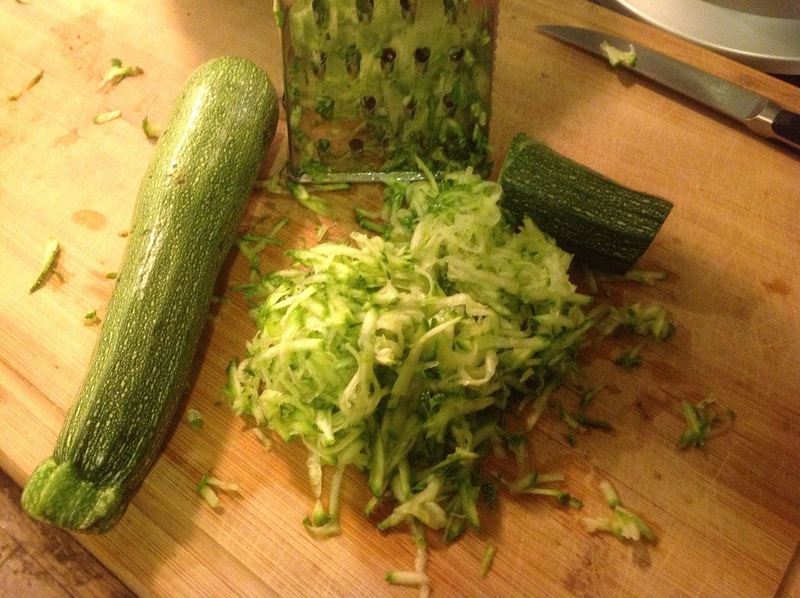 Zucchinis are so mild in taste that they make a perfect component for a muffin. They also contain a lot of water so they great to replace eggs or even applesauce. If mentioned that I am not a huge baker because you need to be so precise with your measurements. But my vegan muffin creation wasn't as daunting as it was when baking bread. So lets get our booties in the kitchen and start baking! Preheat oven to 350. Lightly grease muffin pan with evoo (or vegan butter). In a bowl mix together the dry ingredients. In another bowl mix together all the wet ingredients (not including the grated zucchini). Combine the two and stir until completely mixed. Take half your zucchini and mix in and then fold in the remaining. Spoon into muffin tins about 3/4 full. Bake for about 30 min or a bit more. To check when done, do the toothpick trick. When toothpick comes out clean, you are ready to go! Take out and let cool. This ain't your kids mac 'n cheese!...Truffle Tri-Color Mac 'n Cheese Muffins! Ummm, yup! These are the adult version of the kid's classic mac 'n cheese! Technically you don't have to use the tricolor elbow macaroni. I used it because well, I had it. The one thing I did notice was the texture was a bit different than the typical elbow mac. But I will definitely use it again for some sort of pasta salad in the future! And, also technically you do not need to make them into "muffins", but I think it is super cute. Plus, it is great to use for portion control! These are good, but I can't say that it is the healthiest recipe! If you are not a truffle lover, there must be something wrong with you. No, I am kidding (although I loooove truffles!). But if you really do dislike it, no worries, just omit it from the recipe or try my other mac 'n cheese recipe and bake them in a cupcake molder. Like that other mac recipe, I added some roasted tomatoes on top to cut through some of that richness of the cheesey cream and truffle. Like that other mac recipe, I added some roasted tomatoes on top to cut through some of that richness of the cheesy cream and truffle. preheat oven 350. Lightly grease muffin tin and set aside. Cook elbow mac according to directions. 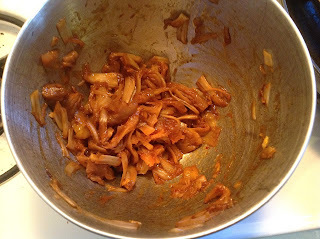 In meantime, take 1 tbsp evoo, heat in sauce pan and saute yellow onions until lightly brown (about 3-4 minutes). Slowly mix min almond milk, butter, vegan cheese and nutritional yeast. Stir until smooth. When pasta is done, drain and return to bowl. Add in your cheese mixture and the truffle oil. Stir until mixed thoroughly. Spoon into muffin tins. Mix 1/2 tbsp evoo with bread crumbs and top each muffin with panko mixture. Bake for 20 minutes. Let cool for 5 min and dig in! As I have mentioned before, I had a one year love affair with kale. Don't get me wrong, we still have dates on a weekly basis, but we had to slow things. We decided eating the same kale dish every single night was a bit too much. I am not sure why I fell in love with this creation so much, but I did. And, every time I make it now, I say to myself "damn, this is good". I have no idea what makes this so good. It literally is just the mixture of those veggies and some seasoning. 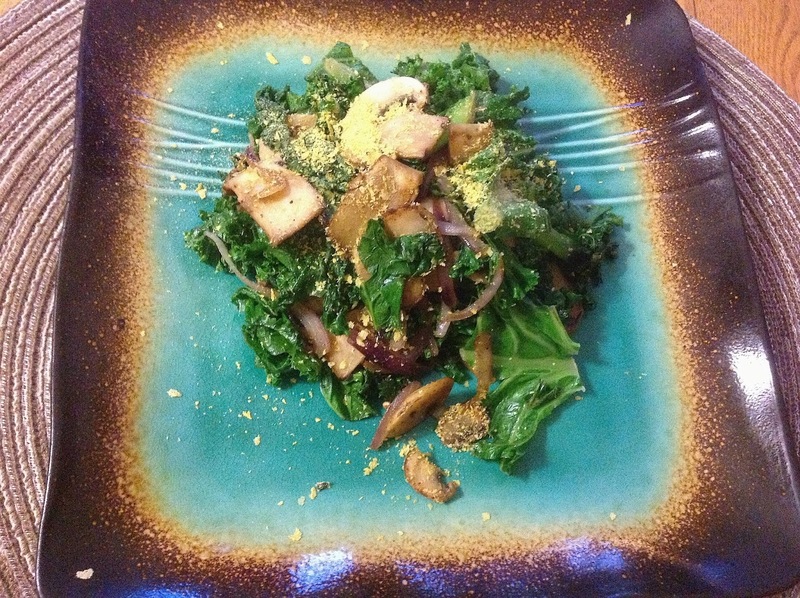 The mushrooms and red onions counteract the bitterness of the kale and makes it mouth watering! Oh yeah, it only takes 5 minutes to make! 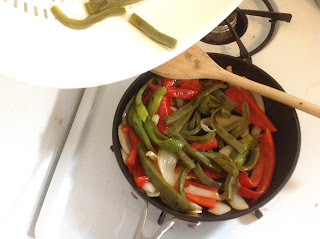 Heat evoo at medium in saute pan. Add in garlic and red onion. Saute for about one minute, add in kale and mushrooms. Season with s + p. Sprinkle with nutritional yeast (optional). Serve! There are so many different ways to make your Green Machine Smoothies. So I figured this one will be called V1, or Version 1.0. These smoothies are a great way to boost your morning routine! It's light, refreshing and nutrient bursting. Just one of these juices has 2 servings of fruits and veggies. Raw. Vegan. Gluten Free. Delicious. Best part is, it is impossible to feel guilty when consuming! Brighten your day with a bright green machine. Oh yeah, and did I mentioned it only takes 5 minutes or less to prepare? Bonus! throw everything in a blend and blend till smooth. And drink, drink away. Grab your newspaper and enjoy your healthy morning! Ryan has been having a really good week, I must say. He has had some of his favorite dishes multiple days in a row! This dish seems so simple, but it is so tasty! If you love the flavors of the south, you do not want to miss this recipe! There are two ways to go about this recipe: A long version or quick version. The long version entails dry kidney beans, soaking them overnight and then cooking them for a few hours. Or you can use canned kidney beans (this is the quick version that I did!). 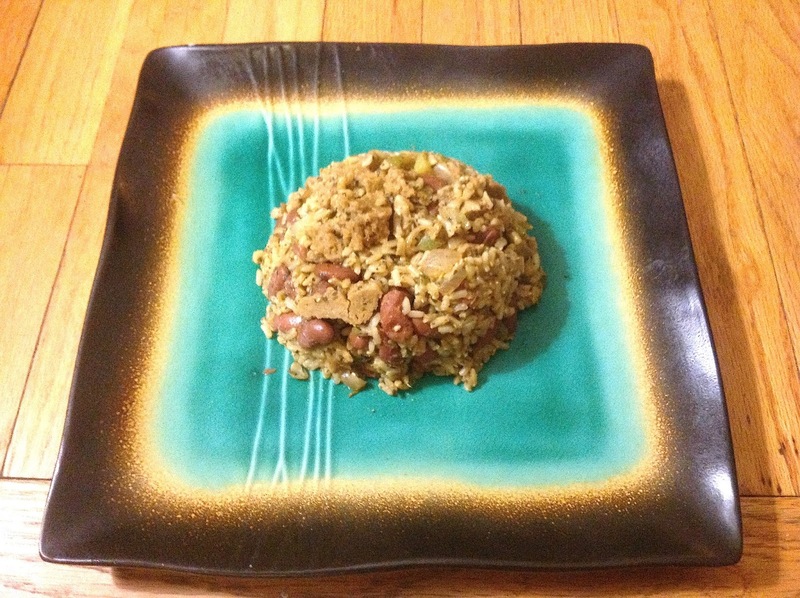 By adding both kidney beans and seitan, you are definitely getting a great source of protein. Wondering what else to pair with this? Try another yummy southern dish such as "creamy"-garlicky collard greens. In a bowl, boil 2 c rice, add in rice, cover and simmer for 20 minutes or until water absorbed. In meantime, heat evoo in saute pan and saute yellow onion, celery, pepper, garlic until soft. Add in kidney beans and the remaining ingredients. Stir thoroughly and heat on low. Adjust to taste. I noticed myself adding in more liquid smoke and about 2 tsp of the adobo sauce. Once rice is done, combine the two and mix together. Get comfy and chow done! Mucha Deliciosa!......Vegan Baked Chile Rellenos! So ever since we moved, Ryan has been wanting me to make vegan chile rellenos. I mean, who could blame the man? When I was a vegetarian, this was my go-to menu item at any mexican spot. They are mouth-watering good, cheesy and oooey-gooey. So when I texted the husband what I was making tonight, his response was, "Love it. So happy". I didn't really know why he was so happy... Maybe something went well at work??? Nope- the happiness came from the thought of chile rellenos in his mouth. 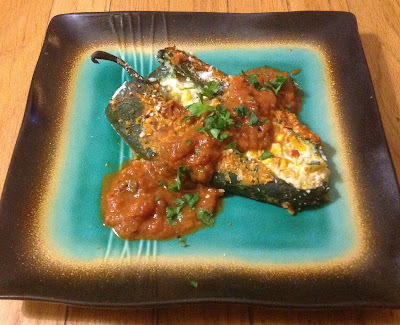 I can't lie though, for me to replicate a version of chile rellenos made me pretty darn excited as well. I wanted to taste that mexican dish that I adored....and well, here it is! preheat oven on broil. Lightly brush evoo on peppers and broil for about 15 minutes, flipping to char each side. When doen, place in plastic bag to sweat. Turn oven down to 350. While waiting for peppers to cool and sweat, start making your corn and cheese filling. In a sauce pan, heat to medium and add in vegan cheese and almond milk, stir until it melts. Add in corn and mix thoroughly. When peppers are cool, remove and carefully peel of skin. Carefully make a slice on just one side of pepper and spoon out all the seeds. Rinse peppers with cool water and dry with pepper towel. Set up drenching station with flour, egg replacer and bread crumbs. Start of with coating each pepper with flour, then egg replacer and finally the bread crumbs. Place on baking dish, spoon in cheesey mixture and bake for 20 minutes. Remove from oven, top with sauce and dig in! But I just wanted something quick, easy and healthy for me to take to work tomorrow. I just bought some raw sesame seeds and gorgeous kale, and there you have it- that's what's coming with me to work tomorrow. 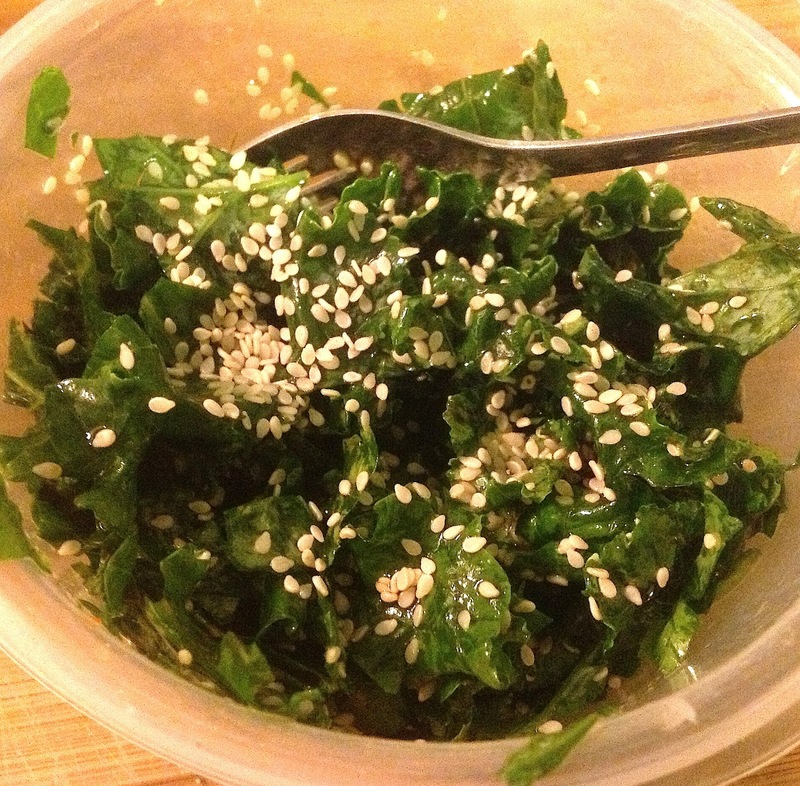 I like to make raw kale salads ahead of time so that the dressing breaks down some of the kale. This way the salad is not so fibrous. If you do this, you may want to drain some of the dressing, if there is a bunch sitting at the bottom. This way the kale won't become mushy. No one wants mushy kale! That's it! Now just mix in a bowl! Less than 5 minute salad! 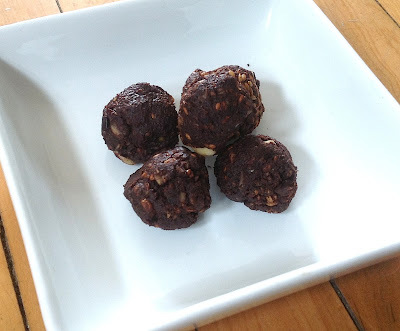 Truffles that are actually good for you and have protein???? I'm in! These are soooo easy to make it is almost ridiculous! You can really alter this depending on what you have in your plantry. I would have liked to use raw almonds, but unfortunately I did not have them. Instead, I used cashews, which actually turned out great! If you can find raw figs, that would work perfectly as well. 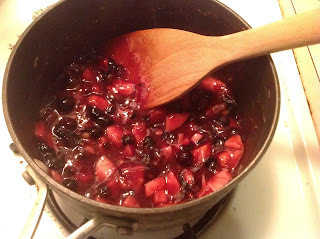 As for me, I could not find them, so I used prune plums instead. These actually worked great and gave it somewhat of a chocolate-cherry flavor. hmmm hmmm good! Add all ingredients in a food processor until thoroughly combined. Form into balls and serve. Easy as that! So it's been so long since I had real meatballs. I would say almost 20 years. I have only had Trader Joe's Vegan Meatballs. And, to be honest, I think that my recipe really hits those Italian flavors and would make a meat eater think that these are the real things! It always amazes me how you can transform TVP, seitan, or jackfruit into really whatever you want. It's all about the seasoning, baby! Try this with your favorite marinara and pasta, as a vegan meatball slider (coming soon) or a light meatball grinder (definitely will be done). I'm a bit embarassed to admit this, but heck, why not? After rolling the meatball mixture with my hands, I actually then licked them clean. Can't do that with meat, now can you? Specifically for this recipe, I did a basil-garlic marinara with a protein and fiber enriched angel hair . It is light compared to spaghetti. But, here is the crazy part: every serving contains 10g protein and 4 g dietary fiber! 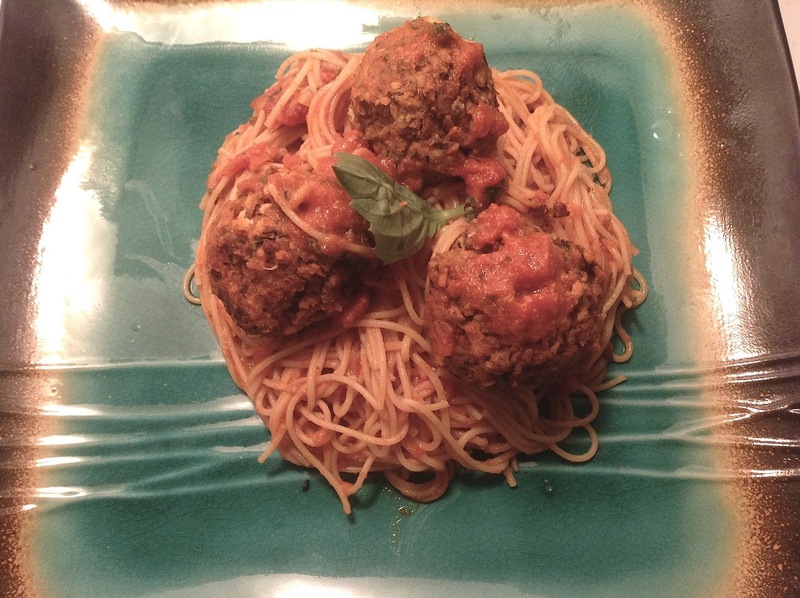 By adding your meatballs, you have a crazy amount of protein in your meal! Preheat oven 350. Mix tvp and all dry ingredient. Add in boiling water, mix and let sit about 10 minutes. Stir in evoo and egg replacer and mix thoroughly. If too wet, add in a bit more panko crumbs. Taste and adjust seasoning to taste. With your hands, roll into balls about 1 inch. Bake for 20-25 minutes (rotating balls a few times) and serve! If you would like them a bit more cooked, broil for an additional 5 min. Jackfruit is the new Meat Replacer!....Vegan Jackfruit Pork Moo Shu! It is native to south and southeast Asia and has a very mild taste, which is why you can transform it into really, whatever you like. It also shreds like pork or chicken to it has a perfect consistency for vegan pulled pork sandwiches, chicken salad or pork moo shu! up in blogs, cookbooks and even local menus serving just that purpose. And it has a "natural" advantage over processed meat substitutes: It's low in fat, calories and sodium, and high in vitamin C. (It is, of course, lower in protein - about 3 grams per cup.)" So, where can you find this? It is not the easiest to find. You can either purchase it in a can or if you are lucky, buy it fresh. Though, it is pretty annoying to cut it up, so I suggest the canned version. Your best bet is to try Asian markets. I found it in China town. I was so excited that we actually found it! 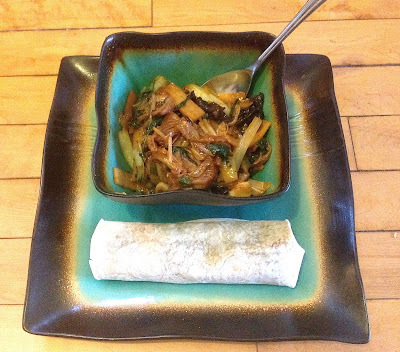 Anyway, because we were in Chinatown, why not make a Vegan Jackfruit Pork Moo Shu? So we stocked up on all those yummy Asian veggies, went home and went to work in the kitchen! Drain jackfruit and pull apart. Set aside. Combine all ingredients for sauce and mix thoroughly. Take half of your sauce and cover jackfruit pork in it. Place in refrigerate and marinade for about 20-30 min. In meantime, heat sesame oil and saute garlic, ginger and the white parts of the bamboo for about 4 minutes. Add in the remaining veggies and continue to saute. Add in enough sauce to cover the veggies and add in marinated jackfruit pork. Adjust seasoning if need be. Place your mixture in bowl and serve with your pancakes. Use any left over sauce if you desire! Power Pops! 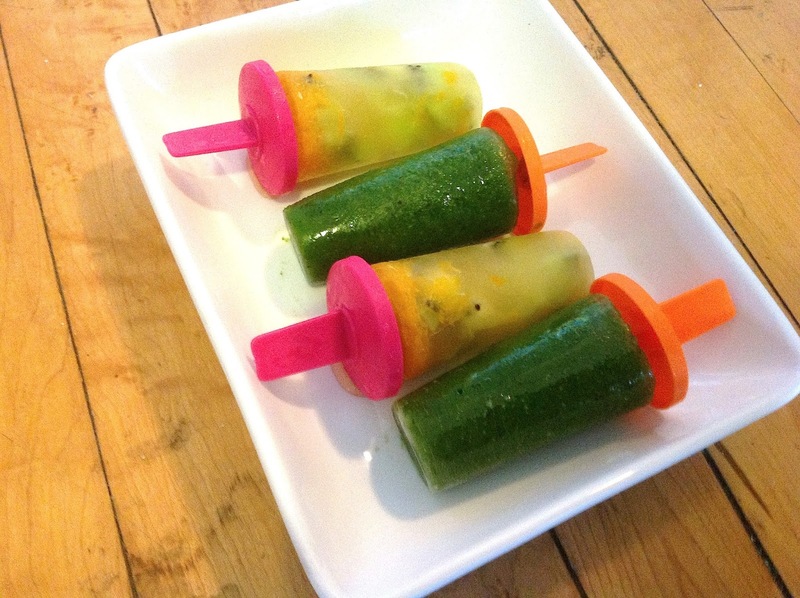 Green Machine and Mandarin Orange-Mango and Kiwi Popsicles! It's August, it's hot and it's time for popsicles! But, pass up the store bought ones or that ice cream truck and opt to make your own! Great for a snack or for dessert. Kids will love them as well! And, this is a great way to get those kiddos to eat both fruit and veggies if you go with the green machine popsicle. As for the Mandarin orange-mango and kiwi, I used chunks of kiwi that is nice to bite into with the varying texture, but is almost visually gorgeous! Green Machine and Mandarin Orange-Mango w/ Kiwi Popsicles! These are so easy to make, I can't wait to try other new recipes! If you don't have a popsicle mold, try using dixie cups with popsicle sticks. A trick to getting the popsicles out of the molds is to run warm water on the outside of the mold until they just slide out. mix and pour into mold and freeze. Fresh Pita! Homemade Whole Wheat Pita! This is so simple, it is ridiculous! When it comes to anything with bread I always feel intimidated. But, once I delve into it, I remember that it really isn't that difficult. The pita is great with hummus or roasted red pepper baba ganoush. Or you can use it as a vessel for your favorite sandwhich or falafel! Whatever it may be, it is always better fresh and homemade! 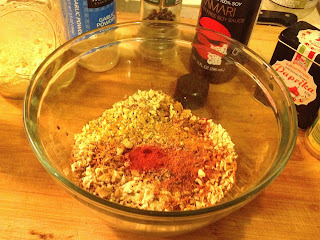 Start off by mixing the dry ingredients together, and then add in the rest. Knead dough on a floured surface for about 10 minutes. Place dough in bowl, cover with moist towel and let sit (i place in an off oven) and rise for 1 hr. Take out from bowl, knead for about 30 seconds and divide in 6-8 equal parts. Roll into circles, place on baking sheet. Bake for 5-7 minutes. The pita will rise into a "puff"- this is normal. 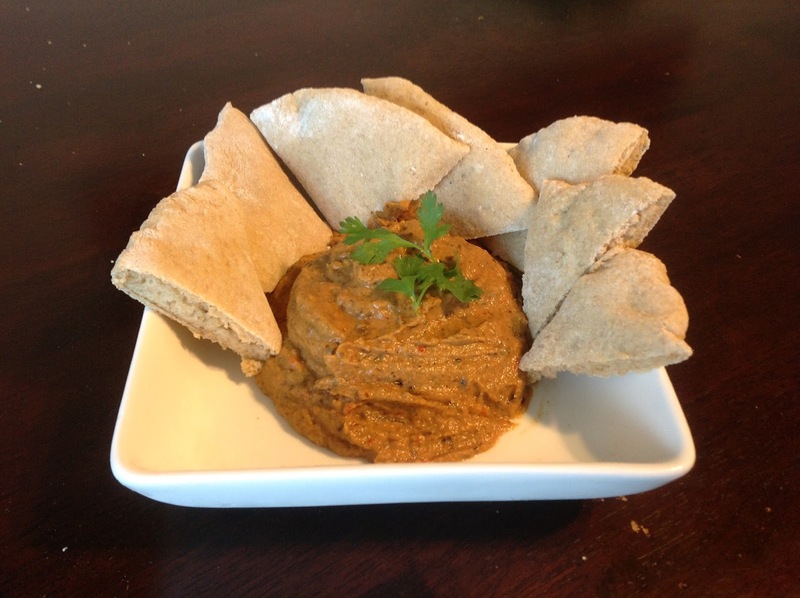 Let cool, slice in half if making pita sammies, or into triangles to enjoy with dips. Chayote Rellonos...huh? 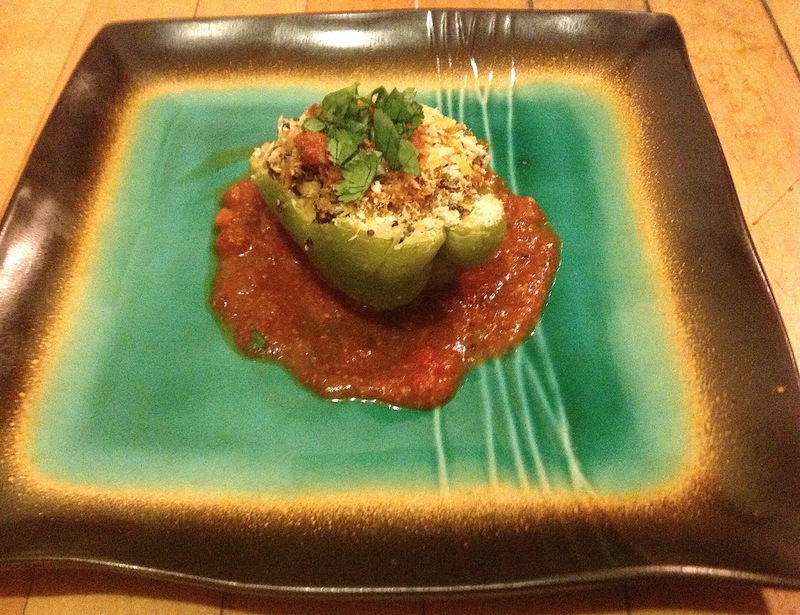 .....Stuffed Chayote Squash with Vegan Chorizo/Quinoa! Have you ever perused a local grocery store or farmers market and have come across something that you never seen or hear of before? And then think- what in the world is that and what can I do with them? Well that happened 2 days ago. Clearly, I had to grab a few. I did a bit of research, and according to wikipedia, this veggie (technically a fruit) is native to Mexico/Central America. It is similar to a combo of a pear and squash. I discovered once boiled, the flavor is very subtle- similar to that of a mild pear and mild green bell pepper. Makes a great vessel for a Mexican version of stuffed green peppers! If you cannot find Chayote, replace with a green, red or yellow pepper. 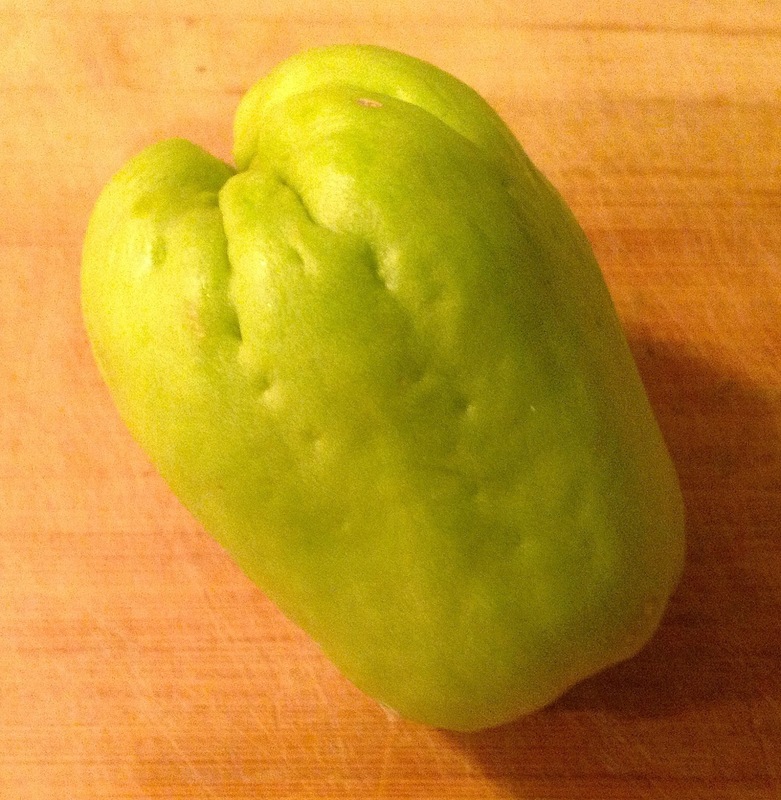 I personally like the very subtle and texture of the chayote. Very unique and nothing like anything that I have ever cooked with! 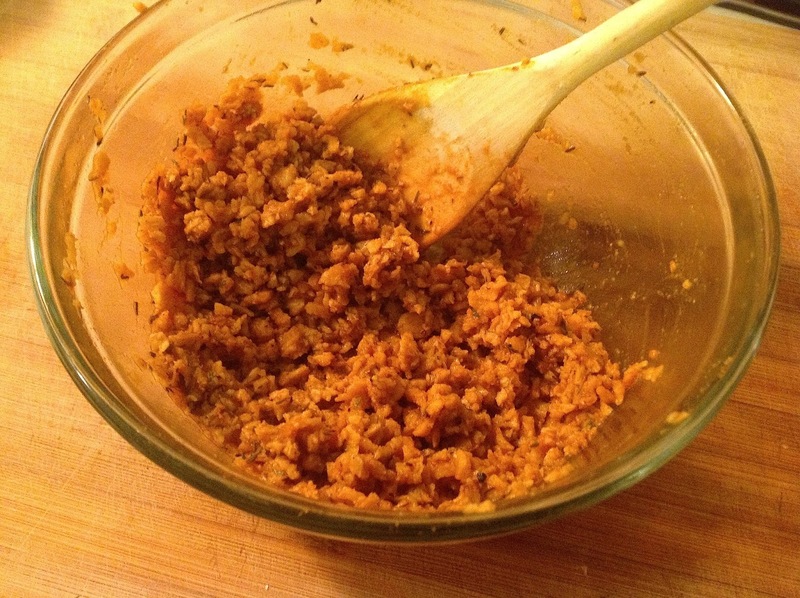 In order to make your own chorizo, you will need TVP (textured vegetable protein) You can find this product in the bulk aisle of a health food store. You can really emulate anything with this product by adjusting the seasonings. Otherwise, you simply just add in boiling water and let it "cook" for about 10 minutes and viola! You have fake meat. In large pot, bring salt water to a boil, and in chayotes and cover. Cook for about 40 minutes. 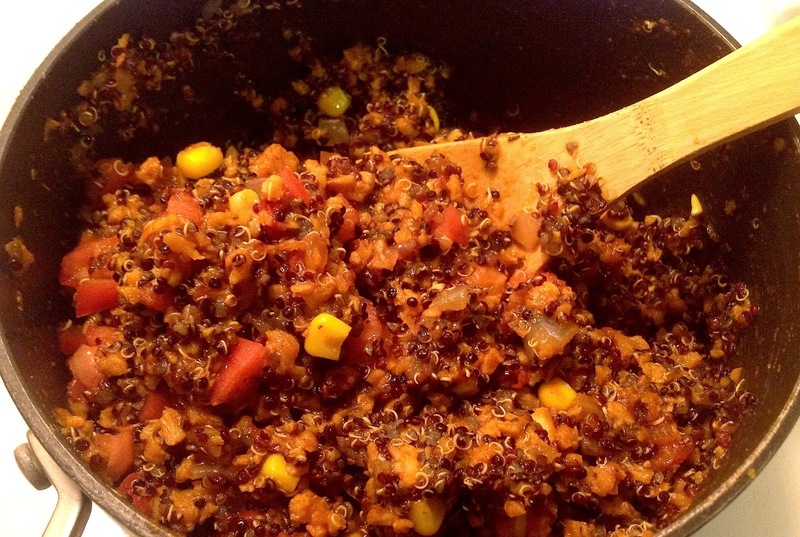 Once quinoa is cooked, add in corn, salsa/tomato sauce and tvp chorizo and mix thoroughly. Add in additional seasoning if necessary. Preheat oven 400. Once chayote is cooked, drain and let cool for a few minutes. Cut each one in half, lengthwise. Remove pit and spoon out flesh. Cut flesh into pieces and add to quinoa mixture. Lightly brush evoo and salt on chayote and spoon in mixture. Top with more sauce, panko crumbs and nutritional yeast. Bake for 15 minutes. 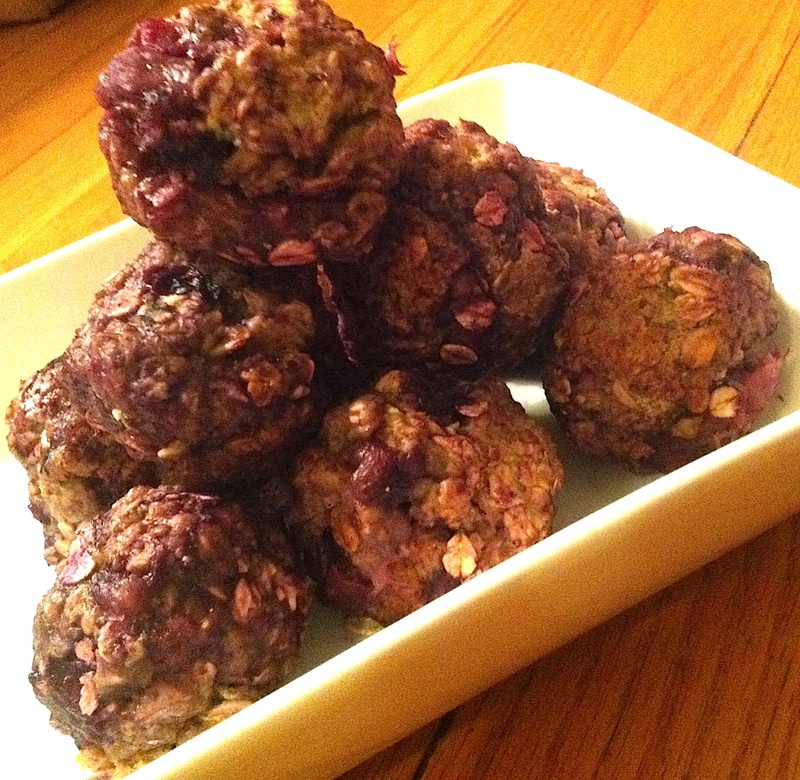 Healthy-Hearty Breakfast Balls!...Vegan Blueberry-Peach Breakfast Power Balls! Toss those donut holes out the freakin window....There are so many other options, such as these power balls! Make in the evening, enjoy first thing in the morning! 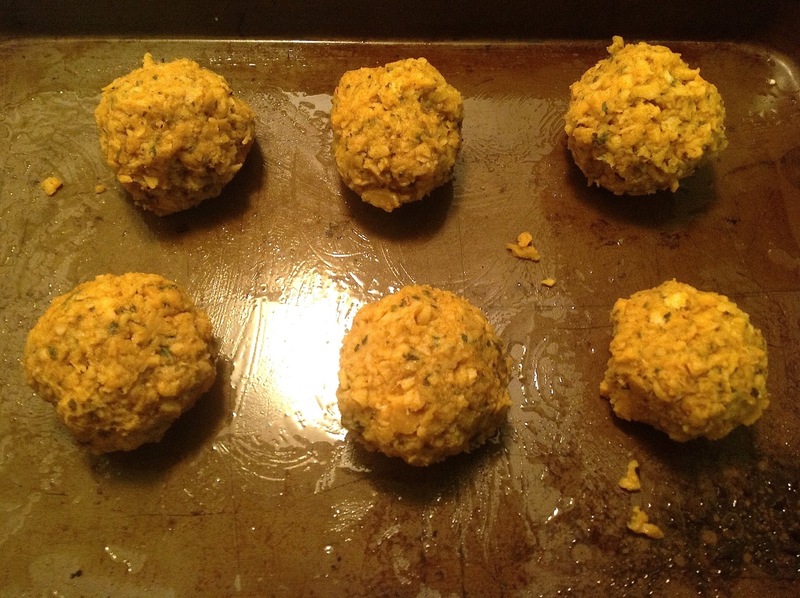 This recipe yields 16 powerballs and you are bound to win every time! I found an amazing deal on blueberries today ($1/pint). This seemed like a perfect ingredient to accompany the abundance of rolled oats in my plantry. And heck, why not throw in a super ripe peach to create a tasty breakfast bite to start things right? At first I was thinking about making these into bars, but it made more sense to roll them into golf sized balls. You only need two of them to be satisfied in the morning! If you would like a reference to what these tastes like, Ryan and I both came to the consensus that they resembled a super healthy blueberry muffin. In blender or food processor, grind 1.5 c oats until fine. Add in with the rest of the oats, baking powder, salt and cinnamin. In seperate bowl combine wet ingredients. Add wet and dry until mixed thoroughly. Now combine the filling with the oat mixture. Form into about one inch balls until all your mixture is gone. Place on backing sheet or oven safe dish and bake for about 30 minutes. Let cool. Great to make in the afternoon/evening and enjoy the next morning or take with you for a snack! 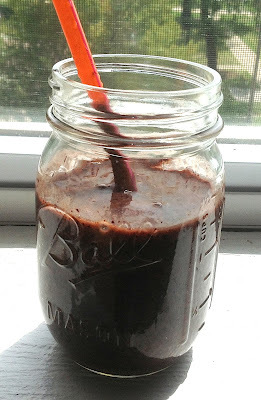 Start your morning off Right!....Antioxidant Blueberry-Ginger-Green Smoothie! Who doesn't want to start the day with a heart healthy meal or drink? For me, smoothies are a complete morning meal. You may need a healthy snack an hour or two later, but generally, this smoothie is filling, super healthy and delicious! The combination of blueberries, ginger, celery and spinach makes this smoothie a powerhouse! The list of this combo can go on for quite some time. 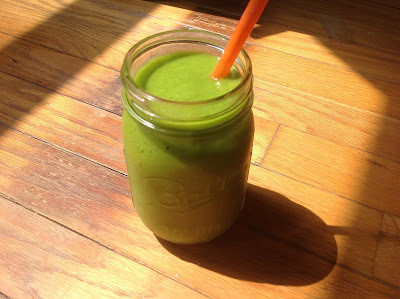 But, overall, each and every ingredient in this drink is a super powerful antioxidant. This is especially great if you are pressed for time. All you need to do is grab your fruit and veggies and blend! This is just the beginning of some great drinks. My juicer comes back home soon (was lent to some good friends) and cannot be more excited! Blend the above ingredients and enjoy!!! Great way to start your day! 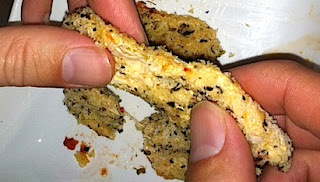 Crazy Good Vegan Cheese Sticks! Oh my goodness! I am shocked at how great these baked cheese sticks turned out! As I have mentioned before, real cheese products are hard to emulate. But these prove me wrong! Cheese was one of the most difficult things to give up for me, so I have been playing around with vegan cheese products to create something delicious. I truly believe that this recipe is the best thus far! Best of all, I learned something regarding cooking today: Trust your instincts! If you think certain ingredients will pair well with your main ingredient, go for it! Trust those taste buds! I knew that the vegan cheese lacked certain elements than real cheese has. So, i added a touch of almond milk and liquid smoke. Simple additions can make a ginormous difference! You can use any vegan shredded cheese you like. I opted for Follow Your Heart Pepper Jack because it has the most flavor. Preheat oven to 350. 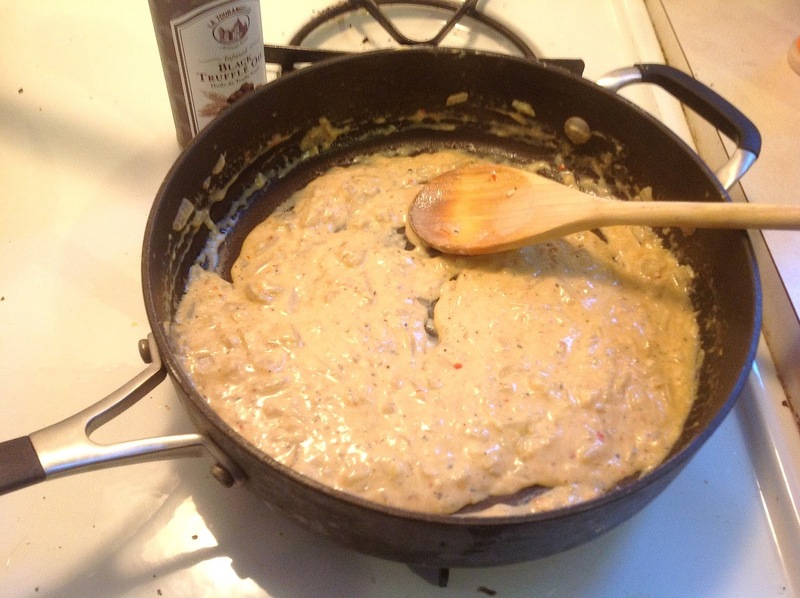 Heat sauce pan on low-medium, add in the vegan cheese, liquid smoke and almond milk. Stir frequently until has almost all melted. Transfer to bowl and stir in 1/2 tbsp panko crumbs in order to create a stick form. Set up 3 bowls. One containing a mixture of panko crumbs, basil, oregano and garlic powder. One with the egg replacer and one with the melted butter. 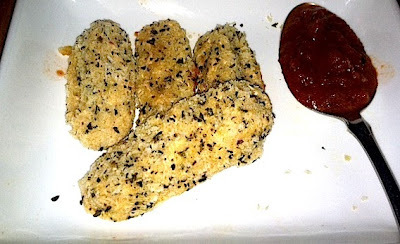 With edge stick, start out with dredging in egg replacer, then panko, then butter and then a bit more panko. Repeat until all the sticks are done. Place on baking sheet and bake for about 20 minutes. Serve with your favorite marinara. 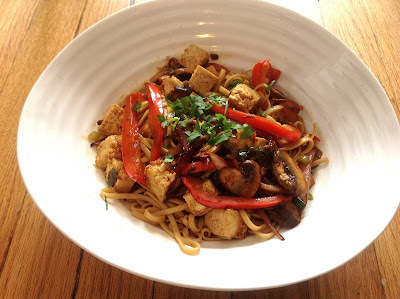 The Low Down on Lo Mein.....Vegan Tofu and Vegetable Lo Mein! And then, right before my eyes, I saw these bad boys. I always read the ingredients and nutritional facts if I have never had a product before. You would be surprised how so many things sneak in milk or eggs! It was a delightful surprise that these Lo Mein noodles contained only 3 ingredients and 10 g of protein per serving! By adding tofu, this is a protein driven meal for vegans! So what is Lo Mein? It is a Chinese dish that is made with wheat flour noodles. It is Cantonese and translates to "stirred noodles". The combination of Tamarin (or soy sauce), agave nectar, hoisen and a few other ingredients gives it a light sweet and salty taste. How can you deny this?? Take 1/4 of sauce and marinate tofu with it. Boil pot of water and cook Lo Mein noodles accordingly (usually 4-6 minutes). In meantime, heat coconut oil and saute onions, red pepper and 1/2 of your ginger. Saute for a few minutes and add in mushrooms and saute for an additional 3-4 minutes. Set veggies aside. In the same pan, lightly saute marinated tofu cubes (sprinkle with flour or corn starch if you would like them crispy on the outside. Drain your lo mein noodles in a collander, place in bowl, add in tofu and sauteed veggies. Toss in the remaining sauce and 1/2 tbsp ginger. Garnish with cilantro and dig in! Vegan Soy Chorizo Taco Salad! Starting to see a theme over here? Well I have to embrace my local ingredients and take advantage of what is in the here and now! I am sure Ry and I will want a change in cuisine sometime soon, but for now, drum roll please.......vegan soy chorizo taco salad! I have been wanting to do a raw version of this for some time, so look for that in the near future! I had some left over cactus salad, so I thought this would be an awesome addition to the salad! It definitely gives it a little sumpin' extra to the typical taco salad that you may be used to. So you can choose your favorite dressing for this salad. I would suggest either an oil free cilantro-lime avocado dressing (healthy version) or a bit more sinful vegan jalapeno salsa cream. Heat a saute pan with evoo and saute yellow onion and soy chorizo until onion is golden. Turn to low and start making the salad. Or, if you haven't already, this is the perfect time to make your dressing! The way I arrange the salad is not to mix all the ingredients, but to pile them on. I start with the lettuce, then throw on the tomatoes and red onions, followed by the cactus salad. When you are ready to eat, I then throw on the warm soy chorizo/onion mixture (that way everything else doesn't get heated and wilted). Drizzle on your dressing and you are ready to go! Yeah yeah, I know- I just did a cactus recipe yesterday. But hey, it turned out so well, why not try more? With that said, don't be surprised if you see other cactus recipes in the future as well. 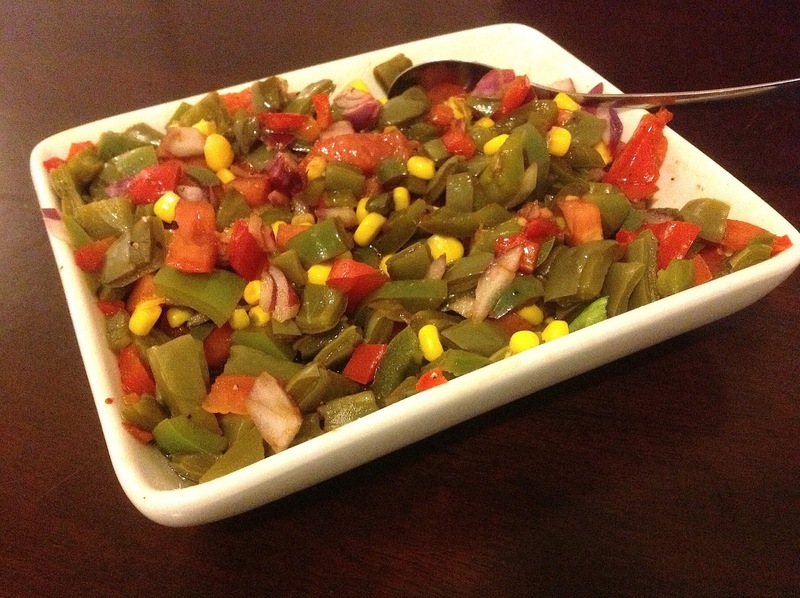 Now, about this cactus salad: It's pretty easy, damn healthy and super tasty. Once cooked, cactus has very subtle taste, with a touch of sweet and sour. The consistency is very reminiscent of a cooked green bell pepper, but trust me, it tastes nothing of the sort. Adding corn and jalapeno really elevate the flavor of this salad. So lets get into it! The are a few different kinds of cacti, such as prickly pear, miner's lettuce and nopales. And, they are becoming a bit more popular and can find them at local farmer's market or some grocery stores. 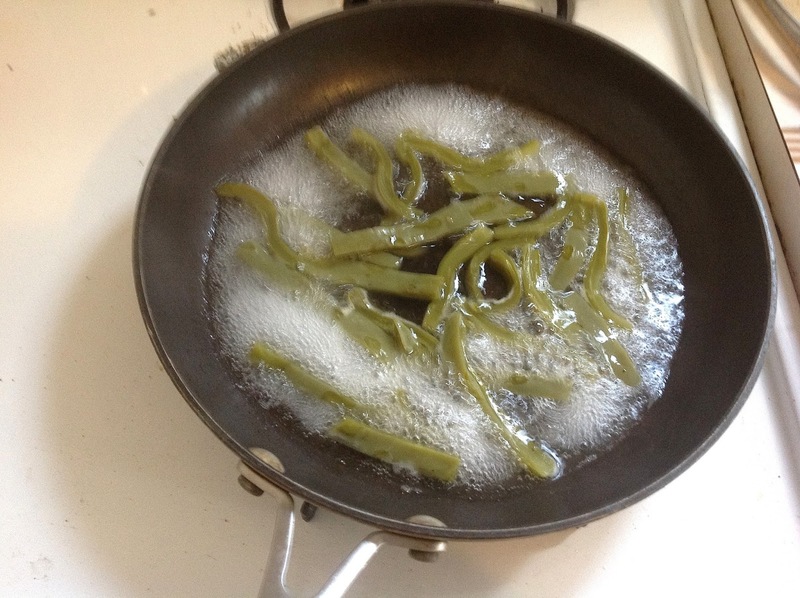 I used nopales and they sure do have some great health benefits. Nopales are rich in vitamins a, c, k, riboflavin, and b6. They are also filled with minerals such as magnesium, potassium, iron, and calcium. Preheat oven 350.In a large saute pan, fill with water and bring to boil. Add in chopped cactus and jalapeno, cover and simmer for 15 minutes. In meantime, in your heated oven, place bell peppers, cut side down and bake for 15 mintues (don't oil). 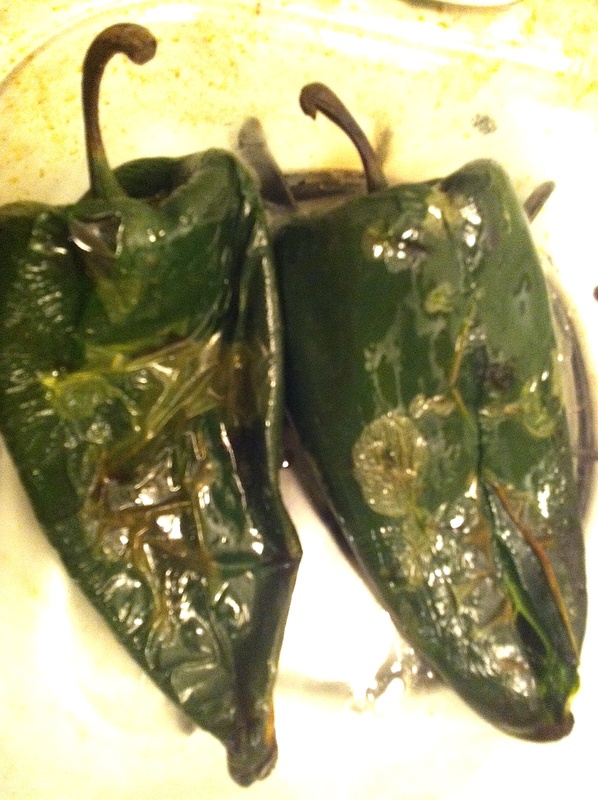 When the cactus and jalapeno are done, drain with colander and rinse. Place in bowl and set aside. Once the bell peppers are nice and soft, take out and chop into pieces and add to bowl with cactus/jalapeno. Now add remaining ingredients and season to taste. Place in refrigerator and let cool. 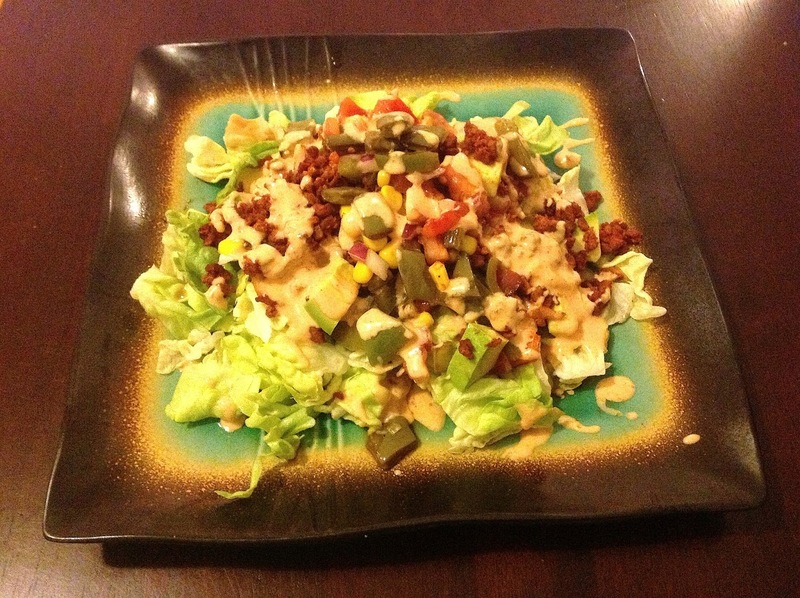 Enjoy as a side, a salad, or even a nice addition to a vegan taco salad!! I suggest that if you are making this dressing, pair it with a recipe that includes something fresh and light. Remember: Just because it is vegan doesn't mean it is guilt free! 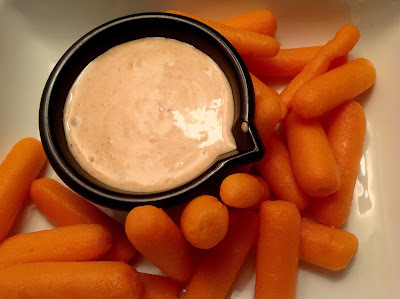 Use this dressing as a light little treat to a healthy salad or dip. 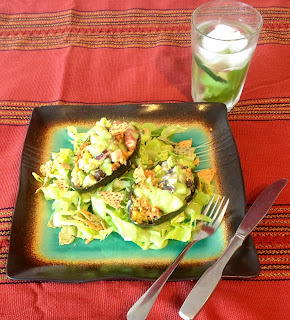 It would be great with a taco salad, stuffed avocado or just veggies. I haven't tried this yet, but I would imagine it would be great on a portabello burger or veggie patty as well! Suace is the Boss! Cilantro-Lime Oil Free Dressing!!! Not like it needs to be said, but sauce is my boss. It drives your dish into it's direction. This easy, raw, vegan, oil free, gluten free dressing is great on stuffed avocados, taco salads, or even as a nice simple accompaniment to veggies. New apartment means New Fun Recipes!.....Cactus and Roasted Bell Pepper Quesadilla! Sorry for my blog being in hiatus for the past week. We were in the process of moving and are finally settled into our new place. While moving can be a pain, it is also exciting! New place and new area of Chicago. This means exploring and discovering new grocery stores! We moved into the artsy area of the city which has a large Hispanic population. This means great new produce that was not readily available at the grocery stores we were close to before. So get ready to see some fun recipes with cactus, squash blossoms and more! I have never cooked with cactus before, so I learned a few tricks. In Hispanic markets, cacti are called Nopales or "cactus paddles". Sometimes you can find them with the stickers or thorns removed (get these)! If you cannot, you will have to take a razor and carefully remove the stickers. Cacti are also surprisingly pretty spicy. To remove the spiciness, do what I did for the jalapeno poppers; boil the sliced cacti in water and cover for about 15 minutes. This not only reduces the heat level, but also removes the slimy sap. End product of the cooked cactus? A delicious and a bit sour product. 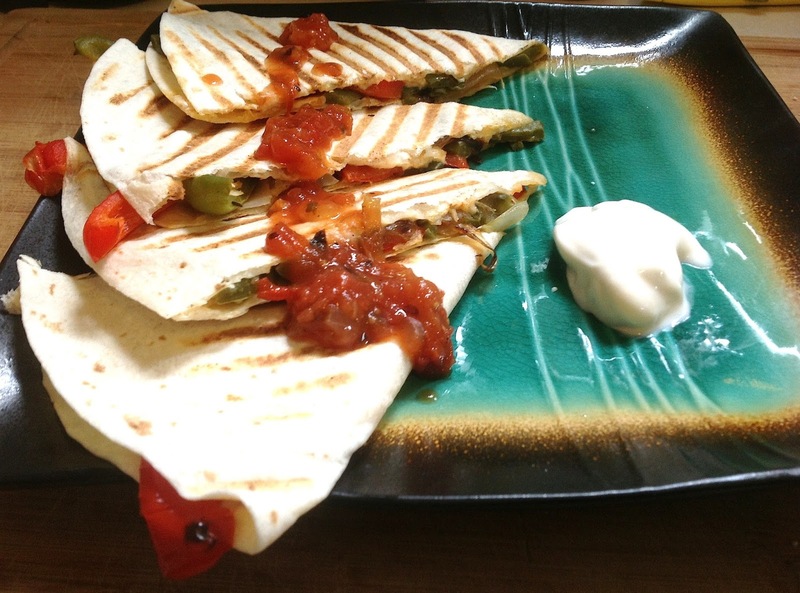 Delicious in this Quesadilla recipe! Cactus and Roasted Bell Pepper Vegan Quesadilla! Preheat oven 350. Place bell peppers, cut side down. Roast for about 15-20 minutes. In the meantime, wash and slice your cactus. In a large saute pan, add about 1/2 inch of water and boil. Throw in cactus slices, cover and simmer for about 15 minutes. In another saute pan, heat evoo and saute onions for about 5 minutes. 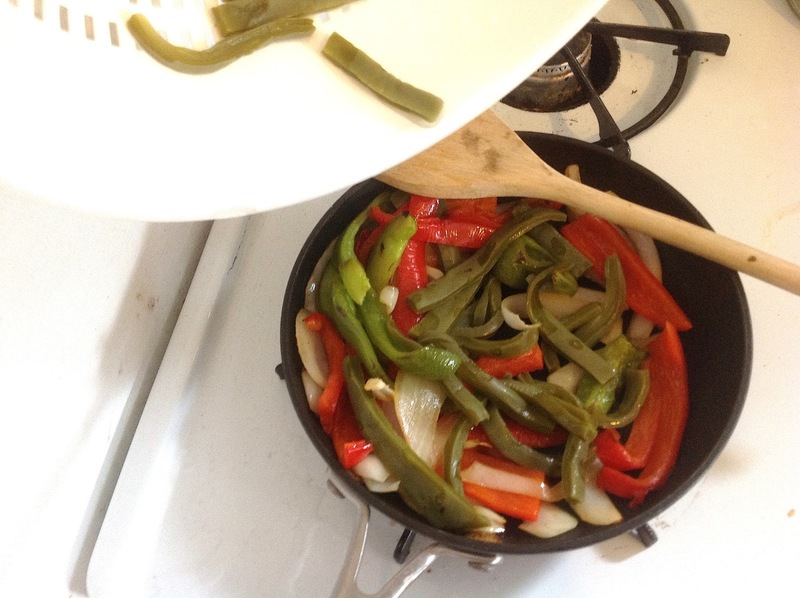 Once peppers are done, carefully slice and add to saute pan with the onions. Season with salt. After the cactus strips are done, drain and rinse in colander and add to your sauteing vegetables and set aside. Heat a George Foreman grill or panini maker (if you don't have, can cook in pan). While it is heating, place your cactus/pepper mix on half of the tortilla, add vegan cheese on top and fold. Place on the panini maker, close and let grill for about 3-5 minutes. Serve with your favorite salsa and vegan cream cheese.